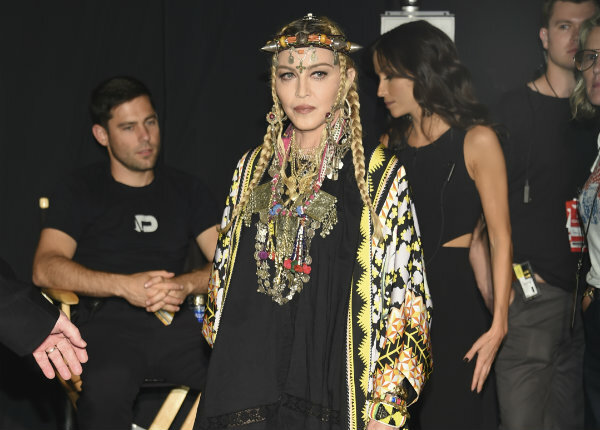 It may have been a lousy night for Madonna at the MTV Video Music Awards, but the event offered some glimmers of hope for the network. The Nielsen company estimated that 5.23 million watched Monday’s annual tribute to what’s current in popular music across several Viacom-owned networks. While that’s down from the 5.68 million who watched last year, the network appears to have slowed the show’s rapid decline over the past years while showing increases in digital engagement. MTV estimated that there had been some 141.6 million video streams of content related to the awards show for the past month — including Monday night — up from 76 million a year ago. MTV said it doesn’t have an estimate of how many people streamed Monday’s entire show through the network’s app. Those numbers hold a greater importance for the younger viewers that MTV seeks, considering how many people experience “television” now on their devices. Among viewers aged 18 to 34, MTV topped all other cable and broadcast numbers for the period of time that the VMAs were on, Nielsen said. Television ratings for the awards show have been shrinking rapidly in recent years. In 2015, for example, 9.8 million watched on television. In 2011, when Katy Perry was the big winner, the show had a record viewership of 12.4 million people. MTV moved the event from Sunday to Monday this year, which is generally a better night for the network, and closer to the middle of August so there would be less competition. The show had its moments, including a glittery Jennifer Lopez medley. Madonna received a harsh reaction for telling a story about the late Aretha Franklin that had more to do with her than the late Queen of Soul. The event as a whole, however, was lacking in star power, with Drake, Bruno Mars, Childish Gambino, Beyonce, Rihanna and Kendrick Lamar among the missing. If MTV can prove that it has arrested the event’s decline, it may make stars more willing to show up in the future. With a double shot of its most popular show, “America’s Got Talent,” NBC won the week in prime-time, averaging 4.4 million viewers. CBS had 3.6 million viewers, ABC had 3.2 million, Fox had 1.6 mullion, ION Television had 1.4 million, Telemundo had 1.2 million, Univision had 1.1 million and the CW had 800,000. Viewers continue to find other things to do. Primetime ratings for the four biggest networks were down by 13 percent compared to the same week last year. Two of the three cable news networks had better ratings than the Fox network. Fox News Channel was the week’s most popular cable network, averaging 2.24 million viewers in primetime, MSNBC had 1.78 million viewers, HGTV had 1.35 million, USA had 1.34 million and ESPN had 1.26 million. ABC’s “World News Tonight” led the evening newscasts with an average of 8 million viewers. NBC’s “Nightly News” was second with 7.4 million viewers and the “CBS Evening News” had 5.6 million. Below are primetime viewership numbers compiled by Nielsen for August 13-19. Listings include the week’s ranking and viewership. 1. “America’s Got Talent” (Tuesday), NBC, 11.14 million. 2. “America’s Got Talent” (Wednesday), NBC, 9.86 million. 3. “60 Minutes,” CBS, 6.29 million. 4. “Big Brother” (Wednesday), CBS, 5.83 million. 5. “Big Brother” (Sunday), CBS, 5.8 million. 6. “Big Brother” (Thursday), CBS, 5.73 million. 7. “The Big Bang Theory,” CBS, 5.51 million. 8. “NCIS,” CBS, 5.4 million. 9. “World of Dance,” NBC, 5.13 million. 10. “American Ninja Warrior,” NBC, 5.08 million. 11. “Young Sheldon,” CBS, 4.85 million. 12. “NCIS: New Orleans,” CBS, 4.76 million. 13. “Celebrity Family Feud,” ABC, 4.6 million. 14. “Bachelor in Paradise” (Monday), ABC, 4.55 million. 15. “The $100,000 Pyramid,” ABC, 4.54 million. 16. “America’s Funniest Home Video,” ABC, 4.54 million. 17. “Dateline NBC” (Monday), NBC, 4.38 million. 18. “Bull,” CBS, 4.21 million. 19. “Mom,” CBS, 4.12 million.